You can book a table on our website (link) or call us a +39 045 595358.For large party bookings and more detailed requests, please call +39 045 595358 or email us at prenotazioni@ildesco.com. What do I need to provide to make a reservation? Depending on the day you book, you may be asked to give your credit card number to guarantee the reservation (the charge will not be charged). Once the reservation is made, a confirmation email with a reservation code will be sent to you. The code will allow you to modify, move, or cancel your reservation, 24h/24h, using the same form. Reservations can be modified online up to 6 hours before your reservation. After that, we ask you to kindly phone the restaurant at +39 045 595358. In cases of late arrivals or no-shows without notifying us, we will charge a fee as specified in our Terms and Conditions. Diners can choose between a tasting menu or order off our a la carte menu. The same menus are available at both lunch and dinner. We kindly remind you that the tasting menu must be served to the entire table. Is it possible to adapt dishes based on allergies and food restrictions? Yes. We kindly ask you to notify our staff of your requirements when you make you reservation so our team is able to organize and plan ahead. I’m a vegetarian, can I eat at Il Desco? Yes, the menu includes vegetarian options. Can I give the gift of a lunch or dinner at Il Desco? How can I book a private dining room? How does Pre Opera work? During the Arena’s opera season, in the evenings where performances are scheduled, it’s possible to dine at Il Desco beforehand at an earlier hour and indulge in their “Overture Gourmet” menu. “Overture Gourmet” is a tasting through which our restaurant begins your operatic journey, with an impeccable and attentive serve and a menu with a rhythm all its own. Four courses with wine pairings allow you to discover our restaurant in the heart of Verona. We recommend you arrive by 18.30 in order to take your time and truly savour your dinner. the Arena is conveniently located just a few minutes away. How can I purchase your book? 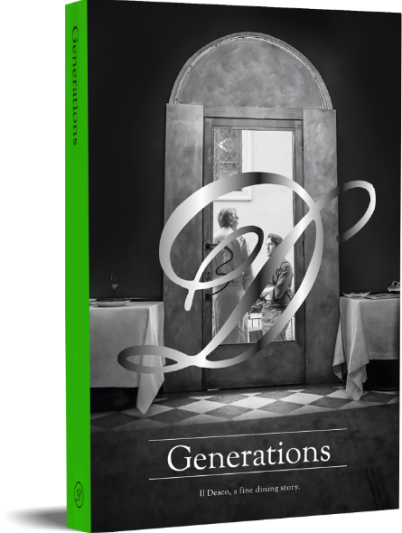 Il Desco’s new book “Generations”, is available online on Amazon and at our restaurant.